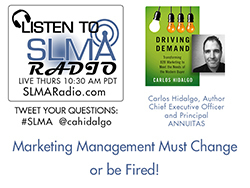 Marketing Management must Change or be Fired Says Author Carlos Hidalgo! ANNUITAS is a demand generation and change management firm that helps B2B marketing and sales leaders at enterprise organizations build and execute demand generation that is more buyer-centric, revenue-optimized and operationally-minded. ANNUITAS delivers this via its Demand Process℠ methodology. ANNUITAS works with clients to determine their demand strategy and process, drives execution and then helps clients achieve self-sustainability and longer-term optimization.